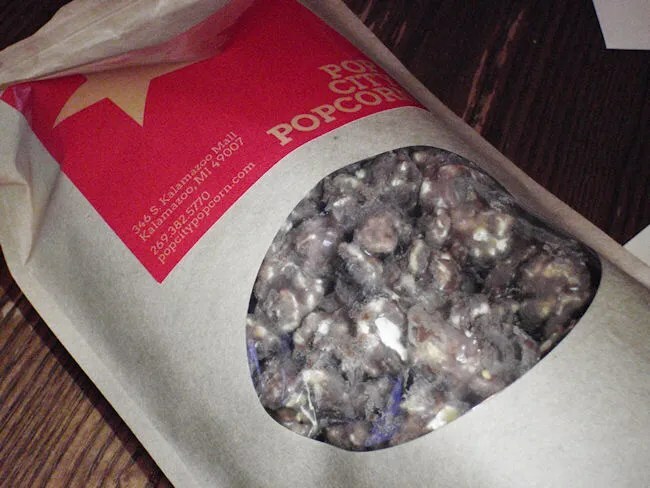 Ever wanted to get movie theater popcorn without actually going to a movie theater? Yes? Keep reading. No? Is there something wrong with you? In the year since L was born, J and I have been out without her a grand total of five times and all five times, J’s mom was our babysitter. We knew eventually we would have to find someone local to watch L so J and I could go out to dinner. We found that someone and since I had Tuesday night off, we decided to to finally make that leap and leave L with a babysitter. J had never been to Old Dog Tavern and I’m always up for a good beer, so that was dinner choice for the evening. After a couple beers, J asked if there was anyplace we could go for dessert. My mind went straight to a new popcorn shop, but we had to hurry….it closed in 20 minutes. After chugging a Will Power Ale that I had just ordered, we raced down the Kalamazoo and somehow managed to find street parking right in front of the shop we were heading to. 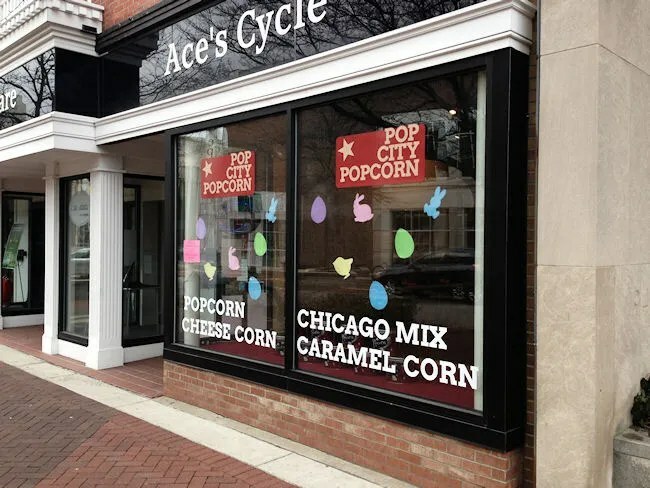 This new popcorn shop is Pop City Popcorn. It’s in the Peregrine Tower on the Kalamazoo Mall near West Lovell Street. We knew we were cutting it close so we sort of apologized as we were walking in the door. It was about ten minutes to closing time and the man working was starting to clean up. We noticed some samples along one wall and since it was closing time, they had actually been capped for the night, but we were told they could easily be taken off if there was anything we wanted to try. J was interested in the Buffalo Wing Cheddar which was really good, but we passed on it for this trip. All the popcorn is already bagged, so even by coming in late, we didn’t really delay the closing of the store. I really wanted a bag of Movie Theater popcorn so that’s what I got. The bags come in three sizes. I opted for the large. J actually ended up picking two different bags for herself. She ordered a smaller “kraft” bag of Chocolate Peanut Butter and a tall bag of Chicago Mix. The bill for the three bags was right around $15. I really considered adding on a bottle of soda due to the fact they had Boylan bottles in a cooler, but they didn’t have any cola and I wasn’t quite in the mood for a root beer. The Movie Theater popcorn was exactly what I was hoping. 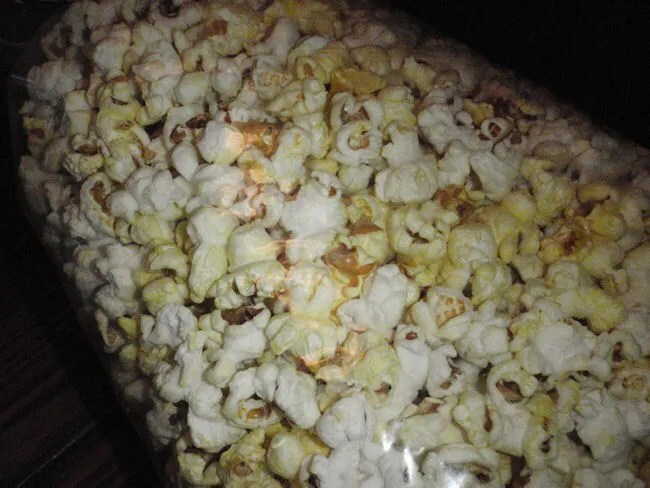 Delicious buttery popcorn. No surprises here. J popped open the bag of Chocolate Peanut Butter first. 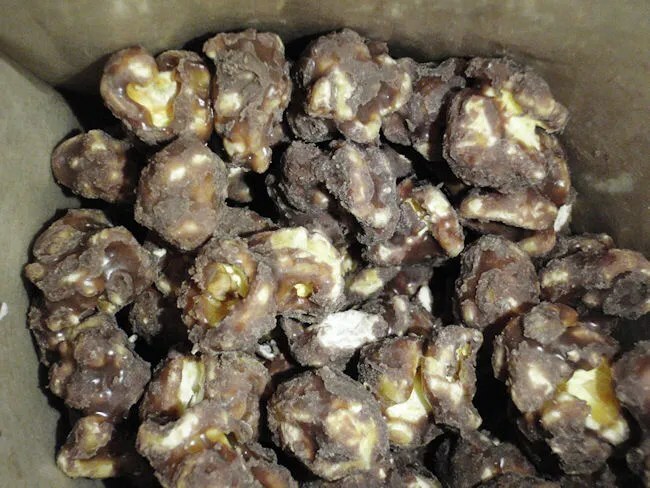 The popcorn is coated in chocolate with a layer of peanut butter. The Chicago Mix is J’s favorite type of popcorn. 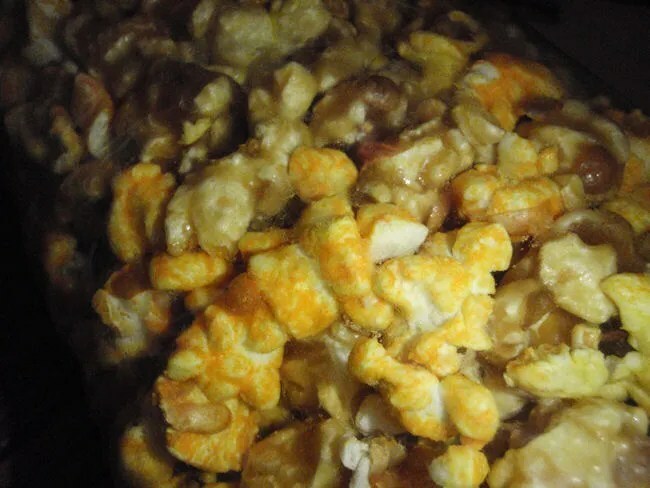 Growing up in Chicago, she had access to Garrett Gourmet Popcorn which actually owns the trademark to the term “Chicago Mix.” It’s a treat that she looks forward to every time we can find when back home. She called Pop City Popcorn’s version a true Chicago Mix and had a hard time putting down the bag. 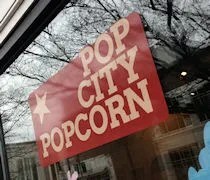 The story behind Pop City Popcorn is pretty interesting. The owners used to be the owners of Gull Road Cinemas until they were forced out for the new Menards development. They didn’t have the funds to open a new movie theater, but they did have a popcorn machine….so, now Kalamazoo has Pop City Popcorn.